Joined us after we started on March 14? No worries! All the prompts will be posted here. A quick #7MagicWord "How To"
These prompts were delivered over the course of a week and I recommend you take them one day at a time. Carry the prompt in your mind and heart all day. Be conscious and curious and ask the magic to find you. You could follow my favorite magical path: snap a picture, find an image, or make art to add visual magic to your word. Tell the story of why this word matters. Here's what I do just about every day: as I am putting my little one to sleep, I cast my mind over the day. I look for the themes, the "ah ha" moments, and the stuff I'm still trying to make sense of. The word finds me as I release myself from expectation and trying to control the process. Then, I either use a photo I've taken or look to Unsplash, an awesome source for free images. Then I go to Canva (app or desktop) which is a great resource when you want to add words to images. Are you following me on Instagram? 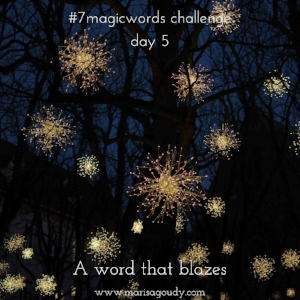 Check out how I make magic every day of the year with my own #365MagicWords project. Check in with the Magic Words Project Facebook group. This is the best place to meet with other Magic Makers and set your daily intention and do your nightly reflection… How do plan to make magic today? How did you live into the magic of the day? * New to this hashtag thing? Write a comment as you typically would and simply add #7magicwords to the end. Whether it’s on Instagram, Twitter, or Facebook, using this common hashtag makes it easier to find and follow your fellow Magic Makers. 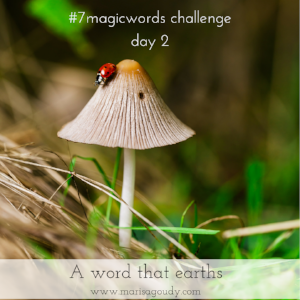 Welcome to the #7MagicWords Challenge! I am thrilled that you’re bringing your magic to this project. Thank you for saying yes to your own creativity, your own story, and, yes, to your own magic. 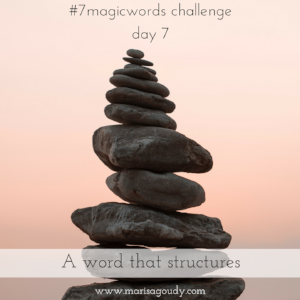 If this is your first #7MagicWords Challenge, I'm so glad you found us! If you can show up for yourself each day, attune yourself to the mystery that lingers around you all the time, and give yourself a moment to decipher its meaning, I promise something remarkable will happen by the end of this week. 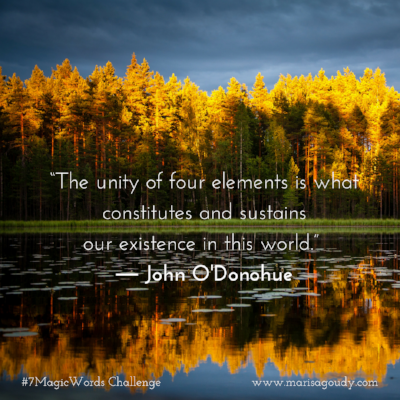 Our theme for this #7MagicWords series is "the elements of creativity." We're searching out all the ways that we can awaken those essential forces within us, just as the earth awakens with the coming of the spring equinox here in the northern hemisphere. And so, let's explore our relationship with earth, air, fire, water, and the spirit that spirals through them all. There once was a young woman who couldn’t find her way into her soul when she sat in the church she was raised in. She felt inadequate. Empty. She felt so lonely as she mouthed all the prayers that were supposed to bring her closer to a power greater than herself. She desperately wanted to feel something. Ultimately, it was nature that called her home to her own heart, awakened all her senses, and helped her find that divine spark in order to become the creative being she longed to be. It was in the swirl of the four elements that she discovered the sacred. Thanks to all the ways that earth, air, fire, and water worked on her, she began to find the fifth element - spirit. She found it everywhere. This is my story. And whether you’ve ever had a crisis of faith or you’re just looking to connect to truth, identity, and creativity in a fresh, embodied way, it could be your story too. In the Spring Equinox edition of the #7MagicWords Challenge, we are exploring the elements of nature and how they birth fresh creative energy in us, body, mind, and soul. How will you ready yourself to make a week of magic that connects you the elements of our world, the elements of your creativity, the elements of all that you are? Whew! That sounds like a tremendous task! 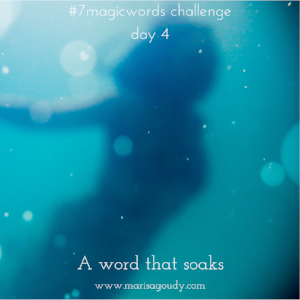 During this week of #7MagicWords, go big and dive deep if you are so called. Or, just ask for a magic word that helps you feel ready for the next day or the next moment. Housekeeping first: If you missed yesterday's prompt, find it here. For details on the “how” of the challenge, please check out the instructions and tips at the end of this message. When you think of “magic” do you picture wands and sparkles and taking flight? When the collective tends to dismiss the mysterious as “airy fairy” and the quest for the sacred with “woo woo,” it’s clear that most associate the magical with being the opposite of grounded. In fact, making “magic” happen is about rooting into your awareness and your inner stores of creativity. It’s about taking the inspiration from “out there” and pulling it into yourself so you can actually manifest something. What if magic is really about making the heavenly fantasy into an earthly reality? What word helps you connect to your own strong internal foundations? What word helps you root in and makes you feel secure? What word connects you to the planet itself? Yesterday, we explored "a word that earths." And we were talking about how magic and creativity are not about taking flights of fancy but, instead, are about rooting into the earth and into yourself, right? Today, you’re invited to explore the completely opposite perspective. Without air, there is no life. Without breath, there would be no word, no spell, no prayer. Without the wind, the dust would never clear. Without a passion for flight, we’d be weighted forever to the hard, cold ground. We are creatures of flesh and bone, after all, but we are also creatures of thought and dream. We need the material world, the tangible world we can see and touch. But, we also need the invisible, unseen realm. We need the air as surely as we need the earth. Take some time today to play with the magic of the breath, with the magic of inspiration. What word lifts you and fills you and excites you to create something new? The heaving ocean. The mirror of a mountain lake. The rushing river. The puddle in a pothole. The cup of water when you're fading from thirst. In the suddenness of a summer rain and the damp of melting snow, the element of water soothes us, troubles us, cleanses us, and rocks us through it all. What cools you off, warms you up, holds you close? What words want to come through as you think about absorbing something new or washing something away? Again, this elemental journey into the magic words is going to breed countless contradictions. Notice that. Revel in it. This is the place to play with every idea that refuses to behave and fit into just one container. 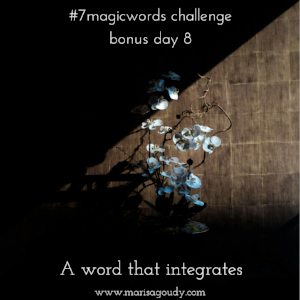 This #7MagicWords challenge is an invitation to think about the elements of nature, of the self, and of creativity. It’s also a chance to dance with the contradictions inherent in our relationship with each one of them. It’s a chance to dance with the shadow and the light and find the true balance. What better way to do that than with fire? The fires rise from your belly can warm or consume, spark your passion or burn the whole damn house down. What word holds what you need from the element of fire? Or, perhaps, what does the element of fire need from you so that you can accept its hot glory as an invitation to shine and light the world with your truth? Air and water, they wash around us and surround us all the time. When you crawl into the belly of a cave, you’re encircled by the earth. When you let yourself soak up the sun after a long winter, you are permeated by fire. The elements spin round us constantly. They can make you feel dizzy. Or, they can make you feel safe and held. Maybe the dizziness is fun from time to time, but let’s focus on being cradled and nurtured by these swirling forces of nature, ok? Today, you’re called to find a word that doesn’t tie you up in knots or make you feel lost in a maze. You’re called to find a word that encourages you to wander, discover, loop back, and see things anew. You might think of a word that spirals as a word that leads you back to the core of yourself, albeit by a beautiful, indirect path. It calls to mind taking to the streets and joining together to advocate for change. It also means buying - and using! - a color coded filing system. Let’s take this idea as an an invitation to slow down and take stock of what is really happening in your own head, heart, and home. To make those spirals from yesterday carry you to their full inspirational, elemental potential, you need to uncover the structure that can hold your process. What word can help you hold all the magic you’ve made this week, and in all the years that took you to this day? Are you intrigued by this balance between spirals and structure? I invite you to explore the brand new Spirals and Straight Lines course that's about to launch. Wow... You have seven words now. They're held together by the magic that is YOU. This is your moment find the connections between this week of words, between the light and the shadow, and between all the ways the elements can create and destroy. Is there one more word that will help you integrate them? Pause and ask yourself how you want to connect to the elements of creativity in the coming season and throughout the year. You have the words that will get you there, after all. Ask these words to keep working their magic. You may want to create a collage of the images you've made over the last week. Or, simply jot them on a post-it so you can see them over the days and weeks to come. Never fear... this is not the end of the magic making! I invite you to explore Straight Lines & Spirals, the new course that is designed to help you take the inspiration and the possibilities that you gathered with these magic words (and throughout your lifelong creative journey) and turn them into the writing, the projects, and the real-life, world-shifting work that matters.